Item and Condition: Brother MFC-6490CW, Used, All in One, A3, Fax, Copier, Color Inkjet Printer. The printer is in good working condition, just needs a clean. This is a color A3/A4 inkjet printer, with ability of scanning/copying, faxing and printing in sizes up to A3. Full specification can be viewed at Brother's website at: https://support.brother.com/g/b/spec.aspx?c=gb&lang=en&prod=mfc6490cw_all Delivery: Due to the size and weight of product I'd recommend collection from WA14 2ND, although I am happy to send it via a suitable delivery courier to mainland UK. If delivery is cheaper than estimated, I’ll refund the difference. Black toner level : 80%. Yellow toner level : 40%. Cyan toner level : 30%. Magenta toner level : 20%. Fully tested. Scanner, print and wireless functions have been tested and are working. Brother MFC-J6520DW All-in-One Inkjet Printer. Condition is Used. Dispatched with eBay delivery – Shutl 1 day. Technology Inkjet. LCD Display 6.8cm colour Touchscreen. Speed 22ipm mono & 20ipm colour based on ISO/IEC 24734. Speed (Fast Mode) Up to 35 pages per minute mono & up to 27 pages per minute colour. Wireless Network Interface 802.11b/g/n (Infrastructure Mode). > 250 sheet paper capacity | Rear manual feed slot | 50 sheet ADF. Standard Tray – Plain, Inkjet, Glossy & Recycled paper (between 64 - 220g/m2, 260/m2 when using Brother BP-71 Glossy Paper) Rear Manual Feed Slot - Plain, Inkjet, Glossy & Recycled paper (between 64 - 220g/m2, 260/m2 when using Brother BP-71 Glossy Paper). 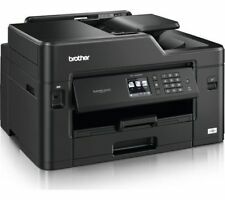 Brother MFC-L8690CDW A4 Colour Laser Multifunction. 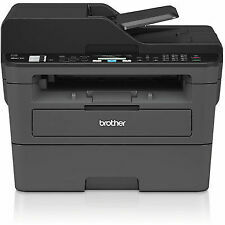 Brother MFC-L8690CDW Printer. Upto 31 PPM in Mono & Colour Print Speed. 9.3cm Colour Touchscreen. 250 Sheet Paper Tray. Max Paper Weight: 163gsm. Starter Toners (3,000 Pages Black, 1,800 Pages CMY ). And with robust construction materials and high-yield inks with a life of up to 3,000 pages, it's long-lasting too. Plus, it has an ace up its sleeve - the ability to print A3 from a compact A4 footprint. 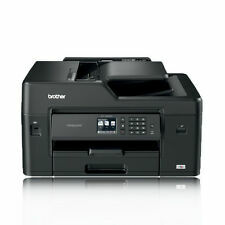 Brother MFC-J6530DW A3 Colour Inkjet Multifunction Printer. 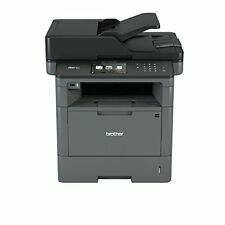 Brother MFC-J6530DW Colour Inkjet Multifunction Printer MFCJ6530DWZU1. Print, copy, scan and fax - all up to A3. Maximum Paper Size A3. 27ppm Colour Print Speed. Brother MFC-J5330DW A3 Colour Multifunction Inkjet Printer - USED. Brother MFC-J5330DW A3 Colour Multifunction Inkjet Printer - Used. Great Chance to get a Used Printer at a bargain price! Up to 35 ppm Print Speed. Brother MFC - J6530DW Full Colour & All-in-One Inkjet Printer, Very little use. Condition is used. The Brother MFCJ6530DW All-in-One Wireless A3 Inkjet Printer is great for creative projects, as it lets you print, copy and scan A3 pages all from one machine. - A3 print copy, scan, and fax from one machine. Part Number: MFCJ4510DWZU1. Brother MFC-J4510DW A3 Colour Multifunction Inkjet Printer. The Printer Broker Ltd is a supplier of printers, fusers and printer parts based in Bolton, Greater Manchester, UK. Best of all, it lets you print in A3 from a compact A4 footprint. Scan to popular cloud storage services directly from the large 9.3cm intuitive swipe touchscreen. Reduce print costs and paper usage with automatic 2-sided print. Part Number: MFCJ5730DWZU1. Brother MFC-J5730DW A3 Colour Multifunction Inkjet Printer. The Printer Broker Ltd is a supplier of printers, fusers and printer parts based in Bolton, Greater Manchester, UK. 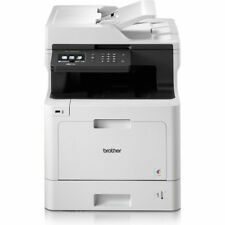 This is a color A3/A4 inkjet printer, with ability of scanning/copying and faxing in sizes up to A3. I'll also send these with the printer as these will be useless for us. We had this All in One printer from new. Part : MFCJ5620DWZU1. Brother MFC-J5620DW - A4 Colour Multifunction Inkjet Printer. The Printer Broker Ltd is a supplier of printers, fusers and printer parts based in Bolton, Greater Manchester, UK. In Original Box with Part Used Ink. 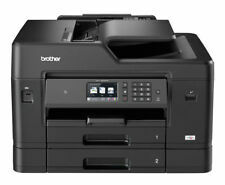 Brother MFC-J5335DW Colour Inkjet Printer | A4 with A3 print capability | Print, Copy, Scan, Fax & Wireless. A3 print capability. A4 print speed - colour text: 20ppm (pages per minute). A4 print speed - black text: 22ppm (pages per minute). Part Number: MFCJ6530DWZU1. Brother MFC-J6530DW A3 Colour Multifunction Inkjet Printer. The Printer Broker Ltd is a supplier of printers, fusers and printer parts based in Bolton, Greater Manchester, UK.  Technology Inkjet. Official Ryman Outlet.  Wired and wireless connectivity. From Official Ryman Outlet.  Wireless NetworkInterface 802.11b/g/n (Infrastructure Mode).  Whats in the Box?.  PC Fax Send faxes directly from your PC. ► Print, copy, scan and fax - all up to A3. They will require a signature. ► 250 sheet paper capacity | Rear manual feed slot |50 sheet ADF. ► 6.8cm colour touchscreen LCD. HP Cashback. Cloud Compatible All-in-One A3 Inkjet Printer with Duplex Printing, Fax and Wireless Connectivity. Cloud compatible. Just use AirPrint, Google Cloud Print or Brother's iPrint&Scan app to connect via any compatible Apple, Microsoft or Android device.